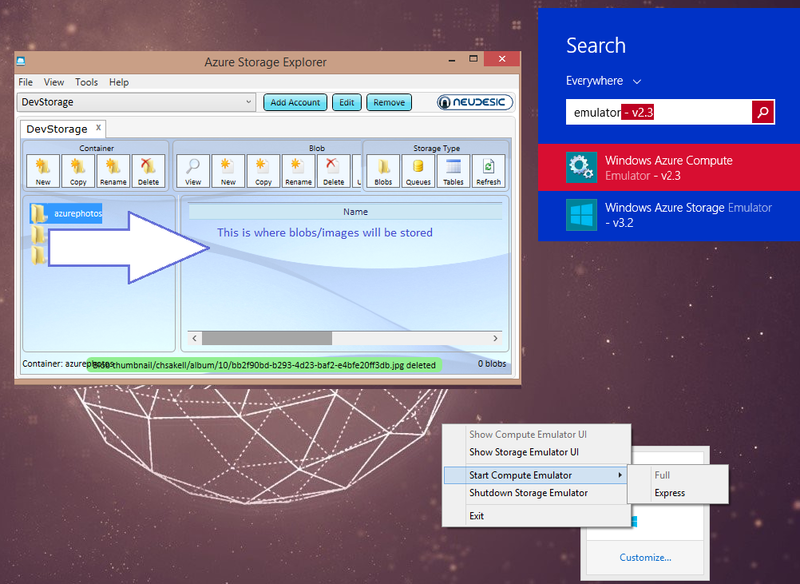 Before moving to the code behind file for this page we need to build an Azure blob client that is capable to store blobs (photos in our case) to the storage emulator. If you want to learn more about Blob storage visit this page. In a nutchel, what we are going to do here is to create a blob container named azurephotos where the client we will build, is going to store our blobs (images). One thing I love about blob storage is it’s hierarchy naming capabilities. Let us pause for a moment: Have you ever notice facebook photos URIs? Here is an example of my favourite artist Armin Van Buuren’s page. In this way, in case we wanted to retrieve all HQ images for a user with username “chsakell” we would use a function listblobs with parameter “http://127.0.0.1:10000/devstoreaccount1/azurephotos/hq/username. In case we wanted to get all thumbnails for albumID=10 we would pass the parameter “http://127.0.0.1:10000/devstoreaccount1/azurephotos/thumbnail/username/album/10 and so on..
// Retrieve reference to a specific created container. // Create the container and blob. int userID = 1; // Foreign key to Table Users..
int albumID = 10; // Foreign key to Table Albums..
string username = "chsakell"; // USE Context.User.Identity.Name for authenticated users..
// Resize image before upload | Create thumbnail for previews..
// Generate a Guid for public file name..
// Log photo to DB..
At this time you should be able to upload your photos..
Let’s continue with displaying the photos in an elegant way: Will will use a tool name fancybox for this and a simple DataList control inside a new Web Form page named ‘MyPhotos.aspx’. *  Media helper. Group items, disable animations, hide arrows, enable media and button helpers. 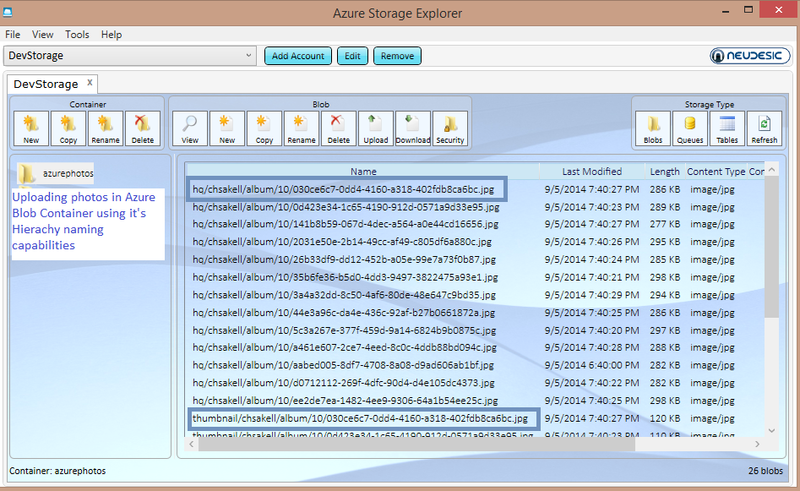 <asp:DataList ID="dlImages" runat="server" RepeatLayout="Table" RepeatColumns="3"
I understand it maybe was a difficult post to follow, especially if you weren’t familiar with Azure Storage services or Azure Storage Emulator. I hope though, by downloading the solution you will make it work to your machine too. 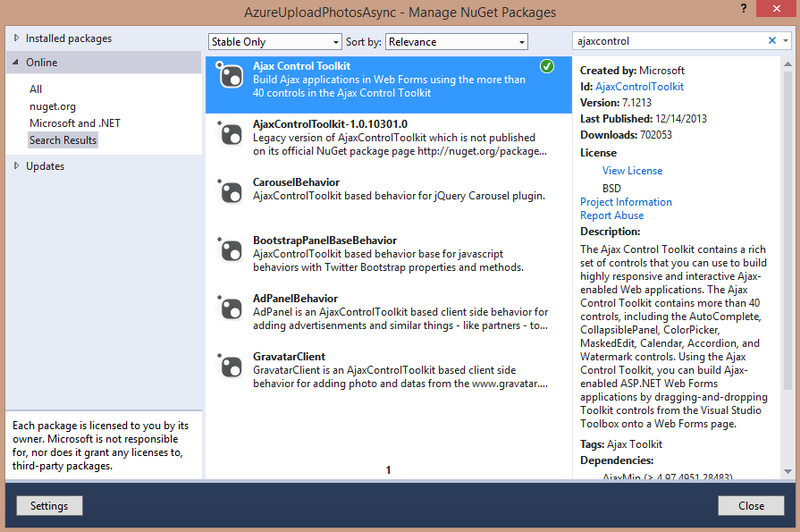 I am big fan of Azure and this is why I will keep posting more for this category in my blog. You can download the project we built from here.